African elephants (Loxodonta africana), also known as savanna elephants, are the largest living land animals on earth today, and live in a close, structured social order. The females spend their entire lives in tightly knit family groups made up of mothers, daughters, sisters and aunts. These groups are led by the matriarch, the eldest female. When separate families bond, they will form kinship, or bond, groups. The adult males tend to form alliances with other males or choose to live mostly solitary lives. At birth, an elephant calf typically weighs 230 pounds and they grow to live for 50 to 70 years. Healthy adult elephants have no natural predators, although lions may prey on calves or weakened individuals. They are, however, threatened by human intrusion and poaching. 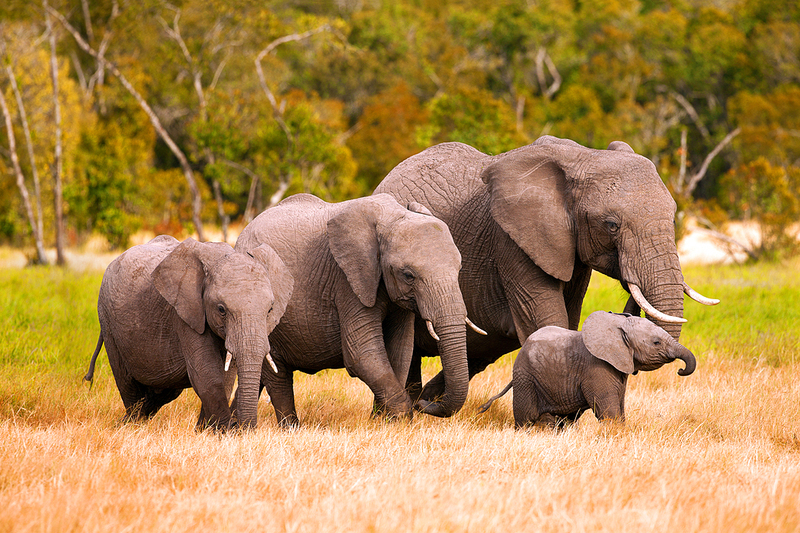 In Kenya's native language of Swahili, the word for elephant is "tembo." A symbol of wisdom, tembo are famed for their memory and intelligence, which is believed to be equal to that of dolphins and primates. In this photograph, taken in central Kenya, a unique moment of order is captured. The matriarch is respectfully flanked by two younger females, with the baby "leading" the herd. This image depicts the closeness that these family units exhibit, with their protective and nurturing side.